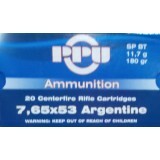 If you've got a rifle chambered in 7.65 Argentine, don't let it sit in your safe--load it up with this ammunition from Prvi Partizan! Each cartridge in this 20-round box fires a 174 grain full metal jacket bullet at a muzzle velocity of 2,625 feet per second. Owners of guns in unusual calibers can often count on Prvi Partizan of Uzice, Serbia to supply new production ammo for their firearms. With over 500 different variations of small arms ammunition in production, PPU is one of the most diversified ammo manufacturers in the world. Their products use non-corrosive Boxer primers and reloadable brass cases.